The present day Tibetan lamas and monks have what we call the SARVASTIVADIN line of ordination, which was brought to Tibet by the Indian Pandit Shanta Rakshita during the reign of the Tibetan Dharma King, Trisong Detsen, in the 8th century. This ordination comes through Rahula, the son of Bhagawan Lord Buddha. There are stories of them arriving on their special mounts, on dragons, on birds, on clouds and so on when the Dharma is in danger. They come when the Sangha are needed, and it is for that reason that Gelongma (Anila) Karma Khechog Palmo decided to undertake the translation of this prayer, which is the shortest one, and which will be of great value in those parts of the world Buddhist devotees pray for the coming of the Sangha. The best way to realise the efficacy of Buddhist prayer, which is not mere ritual as some people believe, is to practise it. To recite what is printed here in groups or alone, with great devotiopn and reverence, uttering all the words from one's very heart. Our prayer is that by reciting this Prayer of Invocation you may yourselves have the living experience of the blessing of the Arahats. We are very grateful for the help of Ven. Ringu Tulku of Gangtok in the translation and for the material he has collected from various Tibet House and Library books to give you a fuller picture of the Sixteen Elders. The sixteen Arahats, Buddhist saints spreading 'Serenity of Mind' also called 'those who have completely conquered the inner spiritual enemies,' were disciples of the Buddha Sakyamuni and having attained the first step of Nirvana were ordered to promulgate the teachings in every direction. According to legend they lived hundreds of years, surrounded by their retinue, which means that they are still spiritually alive, surviving in their spiritual followers. They belong to the so-called Root Lamas (rTsai-hi blama) and some of their spiritual sons finally preached the teachings on the Roof of the World. 1. YENLAK JUNG (known in Sanscrit as ARAHAT ANGAJA or Angad) is usually given the first position among the Arahats. Born in Rajgir, in Bihar India, his father was called Rabzang and his mother Dedenma (the meaning of these Tibetan names is Progress of Goodness and the Happy Lady). It is said that Angaja or Yenlak Jung was miraculously born after his mother had died in childbirth and was being cremated. This of course indicates that she was a holy yogini. He was fully ordained by the Lord Buddha himself and attained Arhatship at the age of 28. He is said to have reached the holy Mt KAILASH, Tibet, In Himalaya, the source of many rivers, where he lives he lives surrounded by an entourage of 1,300 Arahats. Here he taught Buddhism to the children of the gods (devas, celestial beings). They venerated him greatly and presented him with many incense burners (fumigators) and fly-whisks of yak tail (CAMARA -rNga-Yab). After blessing the children Angaja took a camara and incense burner in his hands, one by one the rest of the gifts vanishing into these, which are his recognition symbols, or 'signs'. The camara is a very ancient and well known item of export from Tibet, which is brought down to the markets at the foot of the Himalayas in exchange for goods from the south. Angaja's blessing protects people from disease and misery. 2. MIPHAM (sometimes called MAPHAM (Ma-pham-pa) known in Sanscrit as ARAHAT AJITA came of a wealthy family of SRAVASTI in the state of Uttar Pradesh, India. The Buddha Sakyamuni regarded him as being especially gifted in inspiring moral conduct and discipline in all who met him and he was famous for the powers of meditation. He is usually seen meditating in a cave among the mountains where the animals of the forest, like deers and apes which are sometimes depicted at his side, came to listen to his words. He sits in SAMADHI on an antelope's skin. This great Guru of spiritual and moral Discipline lives on what is called the Rishi's Mountain in remote Himalaya ( Also Mount Transong) with a retinue of I00 Arahats. He meditates on Samatha and Vipasana and his wish is that all meditators will wake up from Ching-wa and Godpa. 3. (NAGNANES) or ARAHAT VANAVASI in Sanscrit, meaning Forest Dweller, was born of a family of Brahmins in the ancient state of Kosala in India. Lord Buddha ordained him and he became a renowned saint after attaining Arahatship. As his name suggests, he loved a life of solitude, and was praised by the Bhagawan for his life of renunciation. His meditation-hut, a cool hermitage of leaves indicates that the common world is a hot place to live because of the existence of passion. This hermitage is a cave called the Cave of the Seven Leaves which a recluse and soothsayer offered to him. It is situated on Mount Lomadunpa where he is surrounded by 1,400 Arahats. He has two recognition signs: the Chamru whisk and the TARJANI MUDRA which is fierce and warning as it is designed to remove all hindering spirits and bring peace to mankind. He is therefore said to pacify the Naga spirits too. 4. DUSDEN (or ARAHAT KALIKA in Sanscrit) The son of a rich Brahmin of the priestly class he was also saved from death, and thereupon renounced the world, later attaining Arahatship in the time of the Buddha. Because of his transcendental powers he was able to preach to the high gods of the Kamaloka spheres in what is called the Heaven of the Thirty Three: there it is said that the children of the DEVAS offered him all their jewels and ornaments and one he carries in his hands. These precious gifts were changed by him into golden earrings as he blessed them - to indicate symbolically that they had lent their ears to the golden Doctrine. He is said to live in this good world JAMBUDEEP (Zangling) as it is called in the scriptures, in an invisible way, and he has a retinue of 1,100 Arahats. 5. DORJE MOYIBU, (sometimes called MOBU- ARAHAT VAJRIPUTRA was the son of Queen Vajri and the King of Kosambi, in ancient India. He was ordained by the Elder Arya Katyana and later became an Arahat because of his superior realisation. He also carries a Chamru, whisk (which is used for honouring the holy book and sending away insects). He again was of such spiritual power that he was able to preach to Yashas and Devas, and control other unseen beings of an angry nature. The chamru was received as a token of the devotion of the DEVAS celestial beings who live on sweet fragrance and music. With his right hand he makes the fierce Tarjani gesture or MUDRA. He is said to live in Ceylon, the Lion Island, Singhala with a retinue of I,000 Arahats. 6. ZANGPO (or ARAHAT BHADRA, his Sanscrit name) was the son of Rabzang, a minister of the Kingly father of the Sakyamuni himself, born in KAPILAVASTU, Buddha’s birthplace. He was given to the Buddha to be ordained by his parents and in due time he attained Arahatship. His hands are in (1) meditation pose, (2) teaching mudra, gesture. Said to live on the banks of the Holy River Jamuna, where he taught the doctrine, with a retinue of 1,200 Arahats. He is responsible for the innumerable reincarnations of people who are born to serve living beings. BARADWAJA SERCHEN ( Known as ARAHAT KANAKA BHARADWAJA ) got his "golden" name from the story that he had the siddhi of producing golden coins from the air and keeping them in the hollow of his palms, to distribute to the poor. His father was also a minister ... in the SRAVASTI state of Utter Pradesh in the northern area of India. The Buddha himself ordained him as a monk and he attained a Arahatship. Around him is a retinue of 700 Arahats and he is depicted with his hands in the meditation mudra. He lives in the Western Country, GODHANA and his abode is called the Source of Light. He was famous for his power over animals. ARAHAT BAKULA (or the Holy Elder Bakula) was born of a Brahmin family in Sravasti. He was considerably older than the Buddha when he was ordained and attained ahatship at an advanced age. The Buddha said he had attained Arahatship by the power of strong faith. He became a monk at sixty years of age. He holds a mongoose in his hands which always produces (vomits) gems miraculously from its mouth, in his left hand, a symbol of the Arahat's desire to relieve the poverty of the world. Living in the Northern Lands of the Sound of Prophecy, he is surrounded by 900 Arahats. This is also the mythological country UTARAKURU (Chang-dra,-mi.nyen). Bakulu is still venerated as founder Guru and MAHAGURU at Ladakh in the Karakorum mountains north of Kashmir. There the spiritual head of Ladakh, called the Bakula Lama, in an unbroken line of incarnations, is revered as the spiritual follower of the Arahat Bakula, who crossed the Karakorum mountains and was the first to promulgate the Buddhist teachings in this remote mountain region. SERBEHU (Sanscrit: ARAHAT KANAKVATSA) was born of a middle-class family of Magadh in ancient India. He was called Golden Calf, because on the same day that he was born an elephant mother gave birth to a golden coloured calf. The Buddha Bhagawan accepted him in the Order of Bhikkus and he later attained Arahatship. Serbehu is reported to have magical powers and he was able to visit the underground abodes of the dragons and Naga snakes and spirits and teach them Dharma. Since they traditionally guard the jewel treasures of the world, he was given a string, or noose of jewels to carry away. His abode is the hill in the Holy Land of Kashmir where the saffron grows, and he is said to live in a cave there surrounded by 500 Arahats. He preaches the Dharma that lifts up the heart and develops intuition. DRANCHENZIN (Sanscrit: ARAHAT RAHULA ) was the son of Prince Siddhartha of Kapalivastu who later became the Buddha Gautama. This name he received because his name coincided with an eclipse of the moon. It was the Right Hand Disciple of the Buddha, the famous Sariputra, who ordained him. Entrusted by Buddha to spread the Teachings, his supreme power of meditation was the impetus by which he reached the thirty-third heaven of the Gods and it was there that the children of the DEVAS offered him the crown that he holds in his hands. Rahula's spiritual line or guru's, or spiritual genealogy or PARAMPARA (bL-ma Dam-pahi brGyud, Sems-kyi brGyud, bla-brgyud: the LINEAGE - leads directly to SHANTARAKSHITA (Zhi-ba-hTsho) who together in the 8th century erected with PADMASAMBHAVA the first Buddhist Temple in Tibet, and being a spiritual descendant of RAHULA is a further example of how the spiritual line of the ARARATS has continued unbroken until the present day. 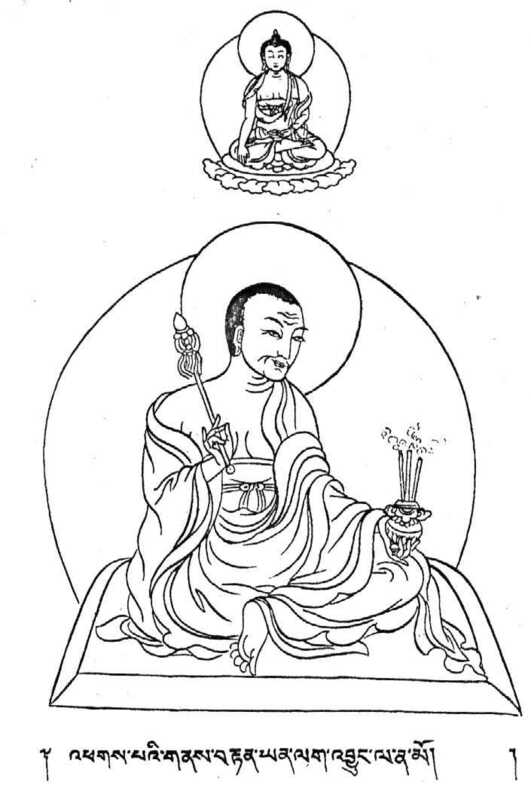 SHANTARAKSHITA was the family monk priest of the King of Tibet, who at the monks suggestion, invited Padmasambhava to Tibet to re-establish Buddhism. With Padmasambhava they founded the first monastery Temple, SAMYE and Shantarakshita initiated the first seven Tibetan monks. He comes from the land of the Priyanka flower, and is surrounded by 900 Maha Arahats. His sister is MANDARAVA, the famous devotee of Rinpoche. LAMDRETEN (Sanscir: ARAHAT CUDA PANTHAKA) was the younger brother of the Arahat Lamchen, sits in deep meditation on a deer skin. By birth he was a Brahmin from Sravasti. Ordained by his brother and later himself became an arahat, he lives on the greatly sacred hill of the Vultures, in Rajgir in Bihar, India, with a circle of 1,600 Arahats. He leads people away from despair towards Nirvana. He too, lived in the 33rd Heaven is often depicted surrounded by the children of the DEVAS, who venerated and served him. SODNYOM LEN (Sanscrit: ARAHAT PINDOLA BHARADWAJA) was born in Rajgir, ordained by Lord Buddha himself and attained Arahatship shortly afterwards. His dwelling place is in the Eastern Region (of the perfect bodies) Shar-luipa-pho) and he is surrounded by 1,001 Arahats. He is depicted with a book and a begging bowl, because he carried his begging bowl like a poor scholar, and in his other hand he carried the sacred books, the sign of his great learning. He preaches the Three Silas, and prays that the clouds of ignorance which darken the faculty of comprehension, may disappear. LUYI DEY (Sanscrit: ARAHAT NAGASENA) was a Prince by birth, and was ordained by the Buddha himself, subsequently attaining Arathatship. He is portrayed with the mendicant’s staff, a begging stick known as Khakkara, in his right hand the Bumpa Vase with the Water of Life (Kundipa) adorned with peacock feathers (Mayurapiccha) which are frequently used to symbolize the destruction of spiritual poisons. He preached in the realm of the Chakravartins or Four World Rulers. The families of the Four Kings offered him precious vases and bowls as gifts. He takes his residence in the King of the Mountains, Sri Parvat known in Tibetan as Ngos Yang, with 1,200 Arahat followers. 16. MICHEDPA (Sanscrit: ARAHAT ABHEDA) was born in Rajgir in Bihar, very sacred to the Buddha. He was also ordinant of the Buddha himself, later attaining Aratship. 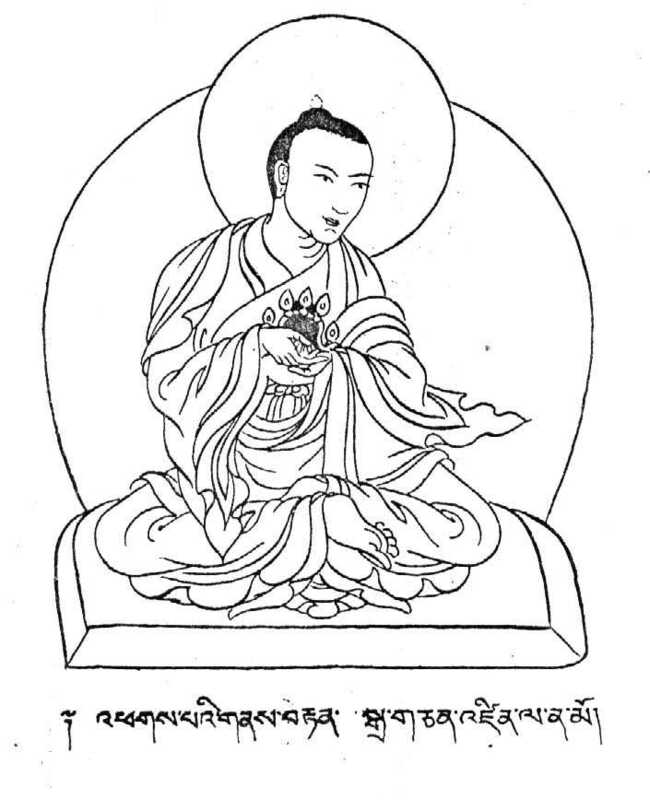 He is shown with his special symbol, a chorten of enlightenment, or stupa in his hands, or in Namaskara mudra, hands folded in greeting, facing a stupa (protection against delusion). His dwelling place is the snow mountain of the GREAT SNOW PEAK near the legendary land of SHAMBHALA, with his 1,000 Arahat followers. This note would not be complete without a word on the GENYEN (UPASAKA) DHARMATA. This faithful helper and servant of the Arahats, carrying books, and looking at the Buddha Amitabha in the sky, symbolises the virtues of the lay family supporters who by their service of love helped the Arahats to complete their work. This short introduction is offered to HIS HOLINESS GYALWA KARMAPA in the Dharma Chakra Centre, RUMTEK, SIKKIM, on the tenth day of the moon, in the Tibetan Buddhist ninth in the year 1972.